TORONTO, October 13, 2018 – The Grade l Pattison Canadian International Stakes at 12 furlongs is a test of stamina by distance alone, but because the race is about a month later than the Grade l Northern Dancer Stakes over the same course and distance, wet weather can turn the international event into a far more demanding race. Last year, for instance, Ontario-bred Johnny Bear (English Channel) won the Northern Dancer over firm going in 2:27.30 but finished last of 10 in the Pattison over a softened course run under showery conditions in which the winner Bullard’s Alley clocked a final time of 2:34.37. Rain again is forecasted for Saturday and soft-turf ability will be key – almost a given for this race, where the fastest clocking over the last eight years was British-based Hillstar’s 2:29 flat in 2014. European runners tend to have more experience on yielding ground and more stamina in their pedigrees to deal with this, and it’s is why seven of the last eight winners of the Pattison were foreign raiders. U.S.-based Bullard’s Alley broke the European streak last year, but he was as happy as a pig in mud with the conditions underfoot and drew off by 10 3/4 lengths at 43-1. Like last year, Johnny Bear won the Northern Dancer this year over firm turf in 2:25.74, but his chances must surely be compromised again because of the expected conditions, based on last year’s showing. Ironically, Johnny Bear’s sire English Channel was a champion turf horse who relished yielding conditions, and many of the English Channels are known for their preference for soft turf. In fact, Johnny Bear’s younger full brother, the four-year-old Ontario-bred gelding Channel Maker, recently won the Grade l Joe Hirsch Turf Classic Stakes at Belmont Park at 12 furlongs over a soft course by 4 1/2 lengths in 2:30.73. English Channel also has English Illusion in the race, and he appears to be in the best form of his career and has acted on ground with more give in it. He was third last out to Johnny Bear in the Northern Dancer, but one race before that he beat that rival at “about” 12 furlongs in a local stakes on good ground in the time of 2:29.72. Still, he hasn’t raced soft ground, despite a pedigree that says he should like it. Bandua (The Factor), Desert Encounter (Ire) (Halling), Khan (Ger) (Santiago), and Thundering Blue (Exchange Rate) are the proven runners on soft or more yielding ground. Bandua, a three-year-old, hasn’t faced older horses but was Grade l-placed in the Secretariat on good ground and acted on heavy ground in Ireland where he won his debut at 10 furlongs and his next start over the same trip. His trainer Dermot Weld wasn’t afraid to send him 14 furlongs in a listed race in Ireland, and despite being a son of the sprinter The Factor his credentials for the 12 furlongs are already established. He’s always been highly considered – he was beaten only six lengths in the Irish Derby in his third start – and may be ready for a career effort. He has a stalking style that will keep him prominent in the running and figures to be around at the finish. He’s 20-1 on the morning line and should be used in the bottom of tickets. Desert Encounter is a European Group 3 winner who has placed in a Group 1 race but is below top class – a good profile for this race. Last out, he prepped for the Pattison with a third-place finish in a Group 3 race at 11 furlongs on soft ground, and he’ll be competitive here, especially if the pace if fast. He is usually held up in last and makes one run. He’s 6-1, but is best played at odds of 8-1 to 10-1. Khan (Ger) is 10-1 on the morning line, which is good value for the winner of the Group 1 Preis von Europa in his last start. German form isn’t as good as it is elsewhere in Europe, but Khan won the 2,400-meter Europa on yielding ground by six lengths. If anything, the Pattison might be too short for this horse, and he’ll be helped by a fast pace on the heaviest ground possible. Thundering Blue is the morning line favourite at 2-1 based on the current form of his last four races, all with jockey Fran Berry aboard. Berry rides him in the Pattison as well, which is a positive, but there are some questions, as well. Until recently, Thundering Blue was a handicapper in Europe, not a stakes horse. He won York’s Group 2 Sky Bet York Stakes at a mile and five-sixteenths three starts back. From there, he was third at the same track to Roaring Lion and Poet’s Word in the Group 1 Juddmonte International over the same trip and last out won the Group 3 Stockholm Cup International at 2400 meters at Bro Park in Sweden. Thundering Blue is by a sire not known for 12-furlong horses, and his broodmare sire, Forestry, likewise isn’t a massive conduit for stamina. Except for his last race, Thundering Blue was mostly effective at distances up to around 10 furlongs, and it’s unlikely that he will stay the Pattison trip under extremely testing conditions. Of the others – and some of them are quite accomplished – none seem likely to handle soft turf. The picks, based on extremely testing conditions, are as follows. 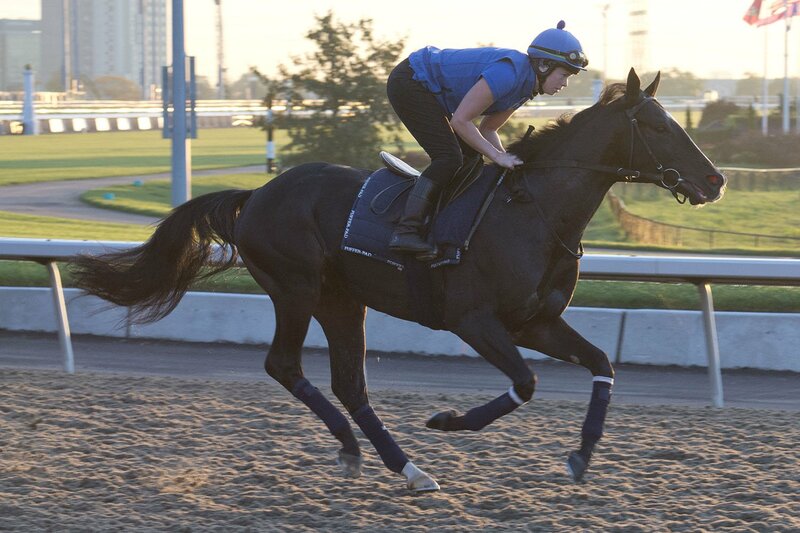 This entry was posted in Woodbine Insider and tagged Horse Racing, Pattison Canadian International, Pattison Canadian International Event, Woodbine. Bookmark the permalink.